Profigold PGV615 5.0m scart to s-video interconnect. Enjoy superior home cinema with crisp video and vibrant colour. Features 4-pin mini din s-video connector one end, scart connector on other end. Die cast connector bodies.24k Gold Plated contacts ensures optimum signal transfer.99.96% OFC conductor for high-resolution picture quality. Cellular PE insulation ensures a clean natural sound. Lifetime limited warranty against defects or workmanship. 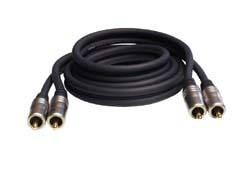 Please note this is a directional cable, video OUT from scart connector IN to s-video connector. This cable does not have IAT suppressors.